All aboard the baby express! Join us for the “unplugged” version of our popular musical adventure where you and your little ones become passengers on the Rockin’ Railroad! “This is one ride every child should take,” says Eric Messenger, Editor, New York Family. Each week, a rockin’ crew and “conductor” take you on a journey through fun activities designed with our tiniest passengers in mind, including movement songs, lap activities, shared musical story time, group drumming exploration, and bubbles galore. The class also explores a different instrument and musical genre each week and meets special puppet friends along the way. We make stops at fun destinations including Instrumentville and Grandma’s House before heading back to Kidville Station! The train’s about to leave…so have your tickets out please! Memberships start at $99 per month. View membership pricing. All aboard! Join us for an exciting musical adventure where you and your child become passengers on the Rockin’ Railroad! “This is one ride every child should take,” says Eric Messenger, Editor, New York Family. Each week, a rockin’ crew and “conductor” take you on a journey through tempo, rhythm, word recognition, and sound identification. The class explores a different instrument and musical genre each week and meets special puppet friends along the way. We make stops at fun destinations including Instrumentville and Grandma’s House before heading back to Kidville Station! The train’s about to leave…so have your tickets out please! Wear your tutus and tiaras! This class playfully introduces the basic positions and movements of ballet using music, games, creative imagery, and stories. Then, enjoy a special tea party in your tutu after the dancing is done. At the end of the semester, the dancers will have a special tea and dance session to share with family and friends. Science is so cool! Kids enjoy real, hands-on investigation and experiments about the science all around them, from air pressure to water flow, from magnets to our solar system. Curiosity leads to industry as we also explore simple machines, tools, building, and how to make things happen! Sometimes our projects and experiments go home, so your kids can teach you a new thing or two! Juggling two kids? Come wiggle and giggle with us instead! We’ve combined elements of our signature Wee Wiggle Giggle and Run, Wiggle, Paint & Giggle programs into a range of activities designed for different ages and stages of development– and only one grown-up lap is required! Books, balls, blocks, tons of toys, music, and more! Unstoppable toddlers build their muscles, imaginations, and confidence as they climb courses, jump on the Tumbl Trak, enjoy our indoor swings, and lift, carry, and stack giant blocks. Teachers guide busy bodies through new skills with games and gizmos that get children excited about exercise and prepare them for gymnastics and sports. Unstoppable toddlers build their muscles, imaginations, and confidence as they climb courses, swing on the rings, jump on the Tumbl Trak, and lift, carry, and stack giant blocks. Teachers guide busy bodies through new skills with games and gizmos that get children excited about exercise and prepare them for gymnastics and sports. Ages:12-18 monthsCurious kids navigate challenging obstacle courses, lift and stack giant blocks, jump on the Tumbl Trak, and play on our indoor swings as they develop their coordination and motor skills. There are so many things to explore as they practice their new ways of moving. This fun, exciting and safe environment gives little bodies and minds big ways to grow! Our gym is full of challenges for growing muscles and minds! Kid-sized event apparatuses introduce children to beams and bars, rings and springs! We playfully introduce activities to promote strength, flexibility, balance, and coordination through non-competitive games, props, and skill drills. 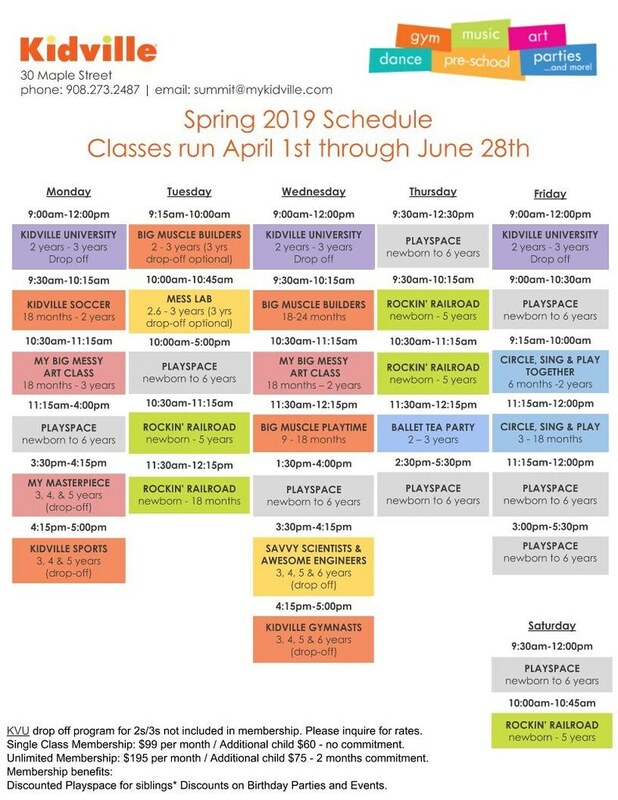 Fitness and fun in one class! Swing! Shoot! Score! With so many sport choices, why choose just one? Build coordination, core-body strength, and agility with non-competitive exploration of balls, bats, hoops, clubs, racquets and sticks. Our instructors introduce young athletes to the basics through lots of playful drills, games and obstacle courses. A creative mind is a problem-solving mind! Young investigators will explore how things work and what happens when art, science, and engineering meet at the intersection of messy and magical. Hands-on opportunities with paint and putty, magnifiers and magnets, blocks and builders, and everything in between help us learn about the world around us and all its mysteries! Join the club! Club Kidville memberships start at $99 per month and entitle you to class enrollment, playspace access, and special member perks. $20 registration fee applies to all new memberships. TERMS & CONDITIONS: KVU Prep and Kidville University (KVU) excluded. Enrollment is for a minimum of four consecutive months for single membership and 3 consecutive months for double and unlimited membership and continuous until written notice is given prior to your next payment. Upon purchasing a class it is understood and agreed that Kidville will collect future payments by debiting the credit card provided. It is further agreed that Kidville has permission to make future monthly debits until notified in writing otherwise. The member agrees to keep their account up-to-date with a valid credit card. If additional costs are incurred by Kidville to collect payments referenced, those costs plus a $45 service charge will be applied. Click the links to see individual schedules by age.